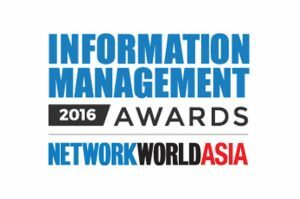 SINGAPORE, 9 June 2016 – i-Sprint Innovations (i-Sprint) is honored to be recognized by NetworkWorld Asia as the winner of Identity & Authentication Management Category of Information Management Awards 2016. The NetworkWorld Asia’s Information Management Awards serves to recognize the innovative solutions and technologies that information security, storage, and data management providers have developed in this region in response to the needs of organizations operating in an increasingly mobile, hyper-connected technology-disrupted and security-challenged environment. “Over the years, i-Sprint has progressively proven itself to customers and the information security industry, both in the region and globally, as a leading provider of identity and authentication management solutions,” said Mr. Victor Ng, Editor in Chief, NetworkWorld Asia. “We are pleased to be acknowledged by the editors and IT leaders on our identity and authentication management solutions. We will continue to innovate and develop more solutions to cater to the needs of the market,” said Mr. Dutch Ng, CEO, i-Sprint Innovations.